Valvorobica industriale has defined an integrated policy “quality, environment and safety” which suits to the company targets, satisfies the requirements, improves continuously the company management system and refers to the objectives which the management intends to pursue. This policy shall be notified and understood inside the company as well as reviewed periodically to verify its fitness. The management of valvorobica industriale has always aimed at running the company in compliance with the procedures and the standards internationally recognized and accepted by the organizations. In 1998 it started taking all the necessary steps so that its occupational, health and safety management system was certified by accredited third bodies. 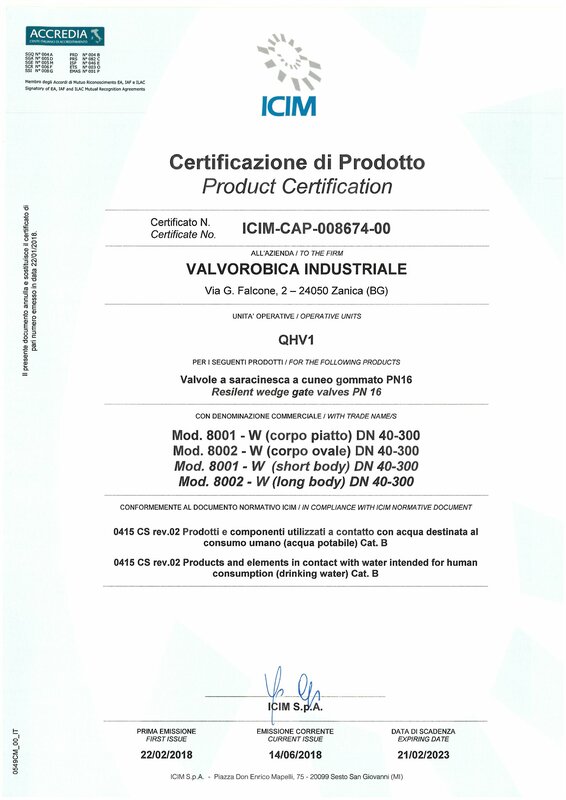 Valvorobica industriale, as manufacturer, has some products which are ascribable to “voluntary” certificates in the scope of the pressure equipment directive (ped). -Satisfying the customer providing the best possible service in accordance with the requirements and the time schedule, offering a wide range of products available on stock and a high support for the research of the most suitable materials. Implementing and improving the chain customer – “internal” supplier with the purpose of making all the workers responsible and satisfying the “internal” customer. Measuring and monitoring constantly the organization in accordance with the quality objectives for a continual improvement. Particularly the “customer’s satisfaction”, the respect of delivery times, the main company working processes and the satisfaction of the human resources. Work in compliance with the legal requirements and other requirements to which the organization subscribes. Identify the significant environmental aspects of its activities, define the objectives to achieve and implement the continual improvement by the defined time-frame. Document clearly its own environmental management system in compliance with iso 14001:2004. Implement and keep always up-to-dated the environmental policy as well as control its adequacy during the periodic reviews. Inform all the people working for or on behalf of the organization about the objectives of the present policy. Highlight its own commitment to the environmental conservation. Take all the necessary steps to reduce the environmental impacts in case of emergency situations. Train the human resources on the environmental aspects bound to their surroundings and teach them how to cope with the emergency situations. Work in compliance with the legal requirements and other requirements to which the organization subscribes in the health and safety field. Identify the hazards and assess the risks in the working environments in order to prevent and reduce injuries and occupational diseases, improving continuously the occupational, health and safety management system. Promote a safe working environment for the employees and all the external personnel who enters the company. Inform and train the employees making them aware of the risks of their work and of the importance for them to follow the rules set, so as to operate in a working environment that does not expose them to an unacceptable level of risk. Define and review the objectives of the occupational, health and safety system. Make this document available to the parties concerned. Define periodically – however on the occasion of the annual review – a program improving the company performance on health and safety in the working environments. On the occasion of the annual review, the management defines the objectives and the markers in accordance with the requirements of the present policy.